Hi, I’m still here! You still there? I’ve been back in the States for a little over a month now and I think I’m floundering. Trying to think of another way to put it, I typed ‘floundering’ into a thesaurus and came up with: flop, stumble, lurch, muddle, flummox (love that word) and even snafu. But the word that was a sort of stab to the gut was ‘wallow.’ Ouch. Am I wallowing? I’m so incredibly privileged to have been able to travel at all and here I am, being a jerk and wishing it could go on forever. Sigh… post-travel come down is a drag. Anyway, besides being a jerk, I’ve also been busy. I’ve re-potted a number of plants, helped organize the garage, gone through my two trunks that my son, Joe, has been holding onto for me (and put some things on craigslist), pulled weeds and turned soil in the garden, mended clothes and my grandkids’ stuffed animals (I’ve become the official surgeon for stuffed animal injuries), helped in general ways around the house (Joe’s house, where I’m staying, that is) and taken long, healthful walks every day. 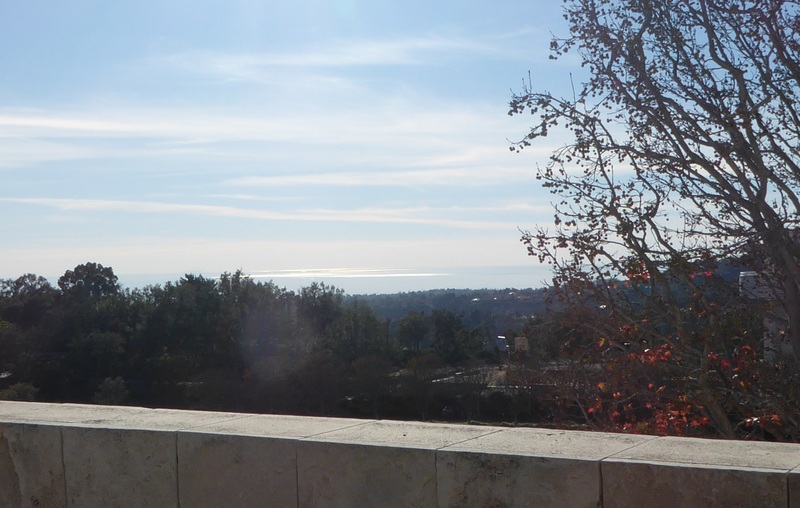 And I’ve gone to the Getty Museum. So, there’s that. So, you park in the garage at the foot of the hill and take a tram up to the museum. 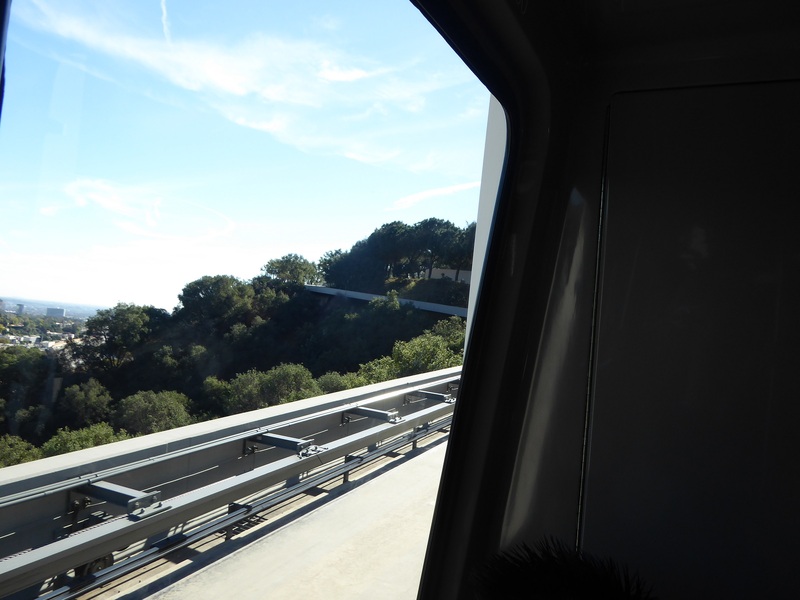 Here’s a view from the tram. Entry to the Museum is free, but parking is $10 – $15. Here are my son and his family up ahead as we enter one part of the museum. It’s actually pretty huge and there are several buildings. I’m not sure it’s even possible to see the entirety of it in a single day. But it’s well worth the effort. 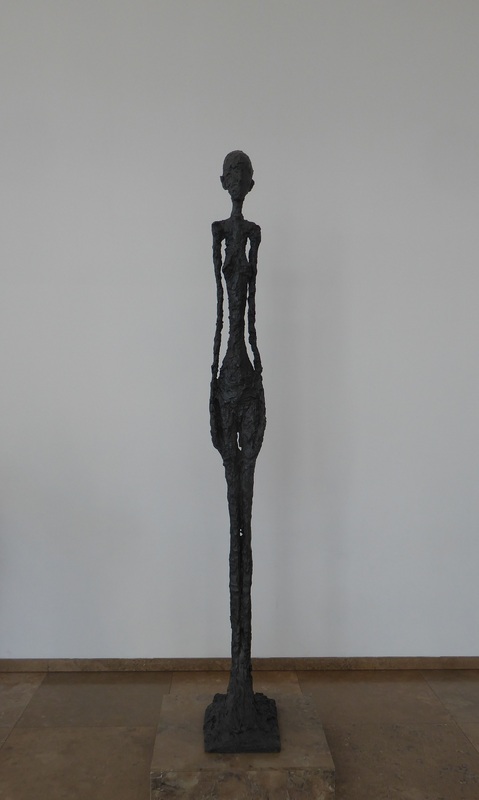 This is a bronze called “Standing Woman 1” by Alberto Giacometti, created in 1960. Here are a few ceramic pieces I particularly liked. I couldn’t find the description for this piece, but I liked it. 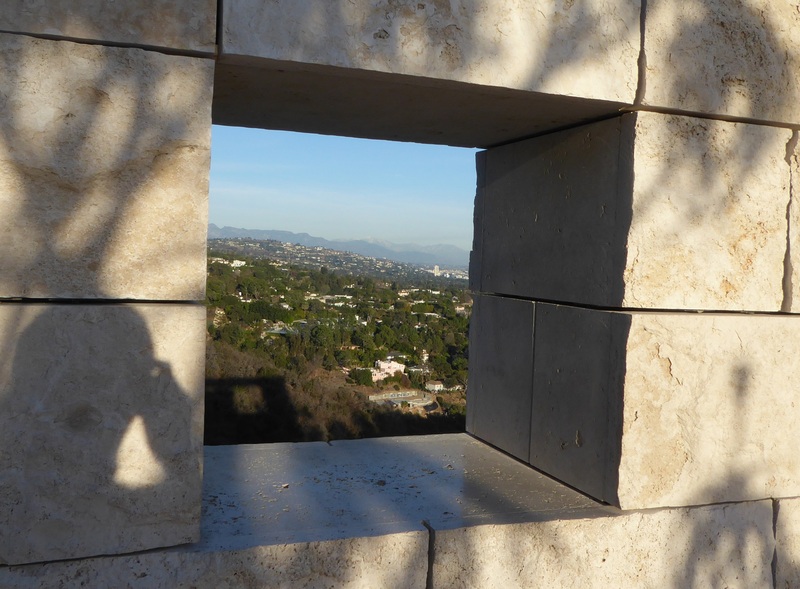 Here are a few views of and from the Getty. 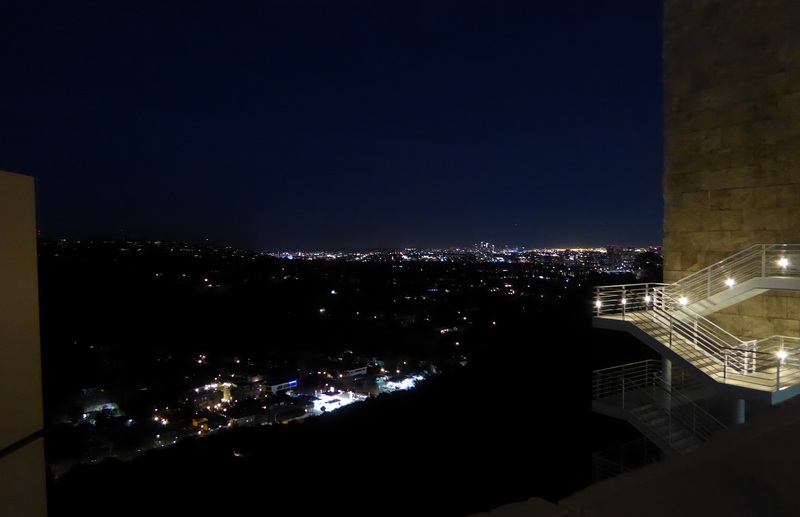 The Getty is north of Los Angeles. 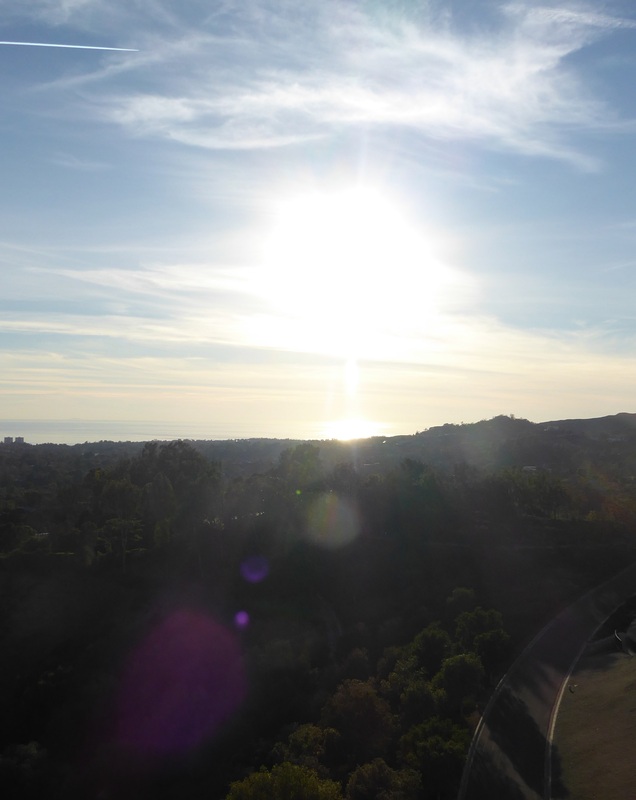 Here is a view of the city with the San Gabriel Mountains off in the distance. A couple views in the midst of the museum and looking out toward the Pacific. 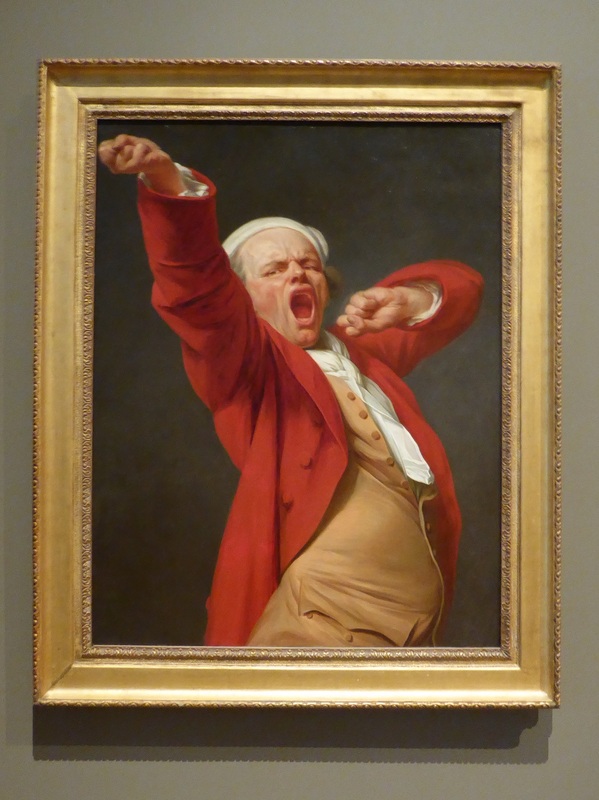 This is called “Self-Portrait, Yawning” by Joseph Ducreux. I just thought it was funny! This is “Self-Portrait as Midas” by Jean-Joseph Carriès. 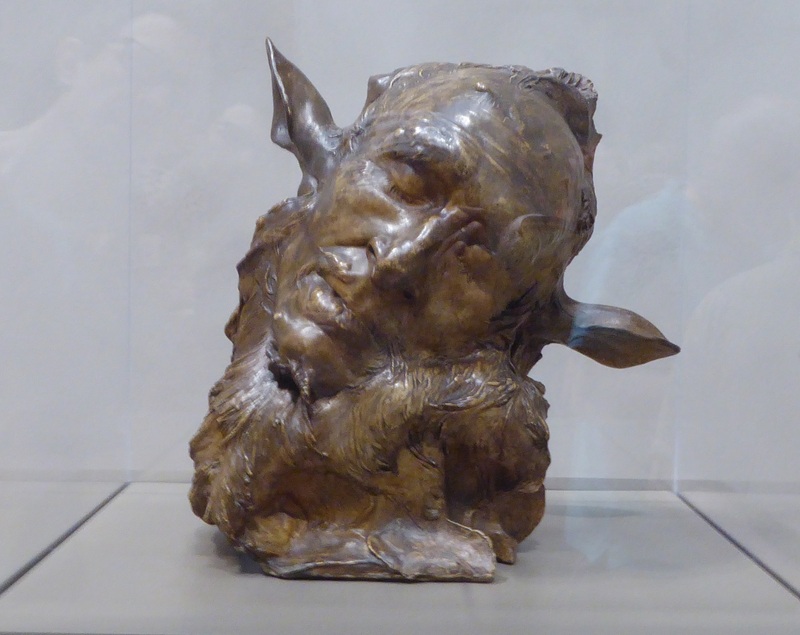 It’s actually patinated plaster – I would’ve sworn it was bronze. 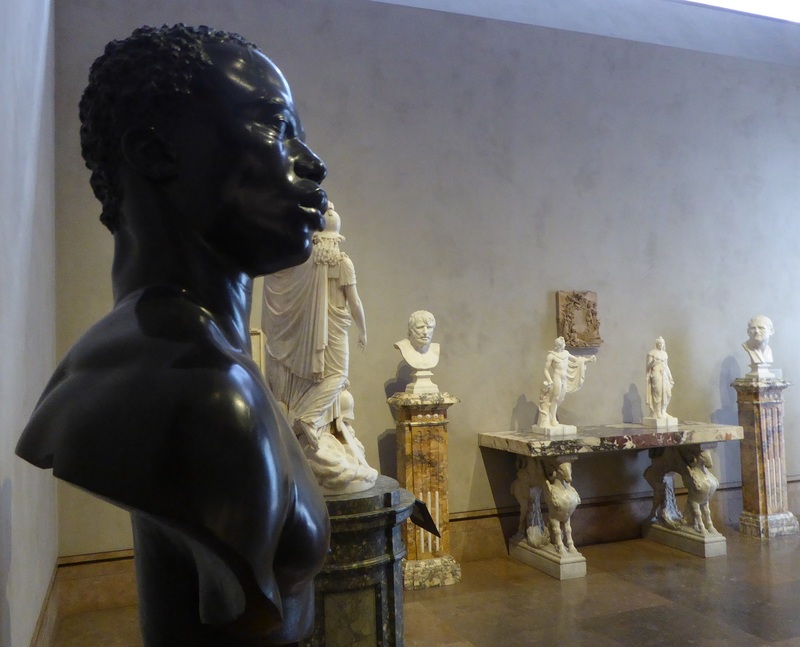 Of all the sculptures in this room, I particularly liked the one at the left. It’s called “Bust of a Man” by Francis Harwood. 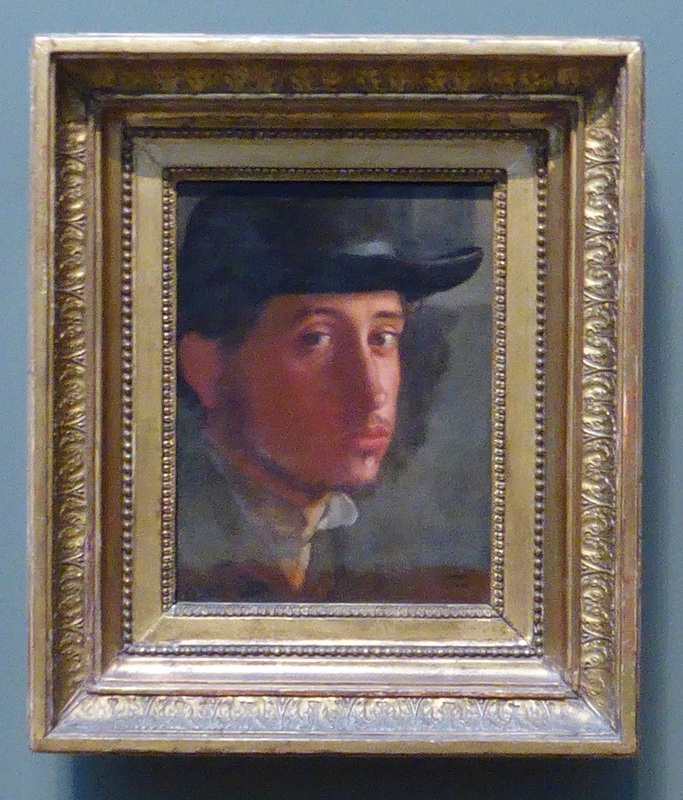 Below is “Self-Portrait” by Edgar Degas. The following two are by Claude Monet and they were breathtaking. 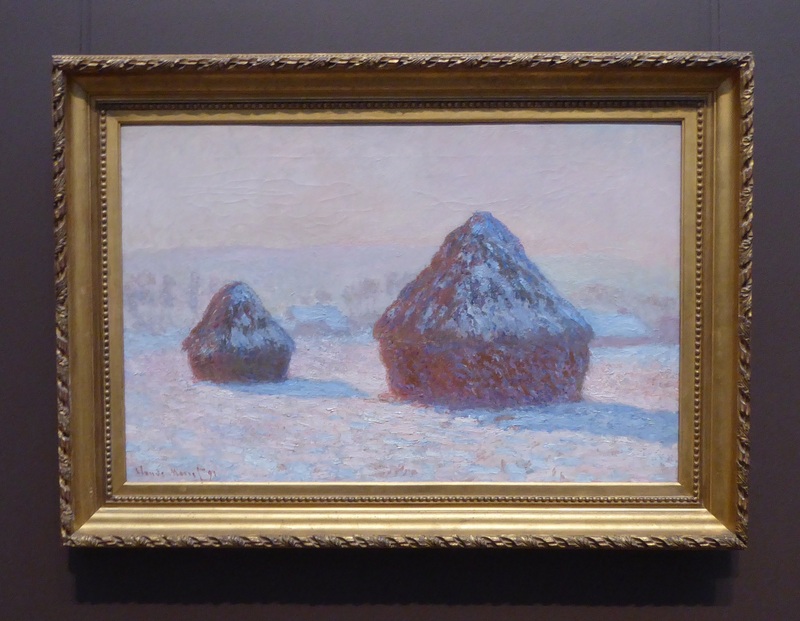 This is “Wheatstacks, Snow Effect, Morning.” You could almost feel the frost. 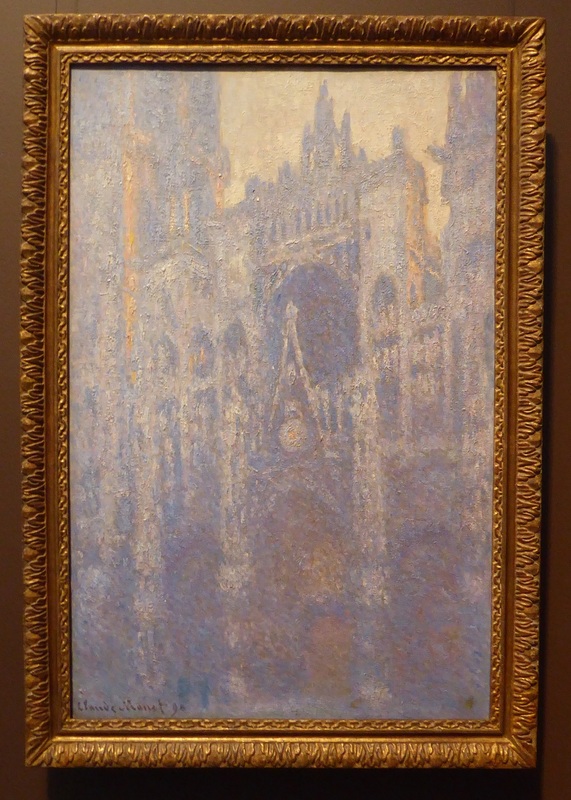 This painting, called “The Portal of Rouen Cathedral in Morning Light” veritably glowed. My photo doesn’t nearly do it justice. I could barely walk away from it. 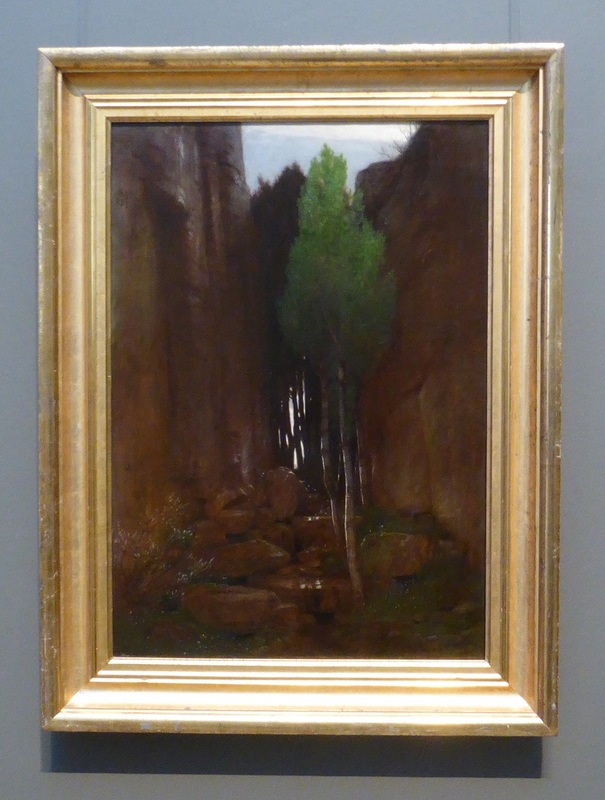 “Spring in a Narrow Gorge” by Arnold Böcklin. Don’t you just want to walk into the painting to see what lies beyond? 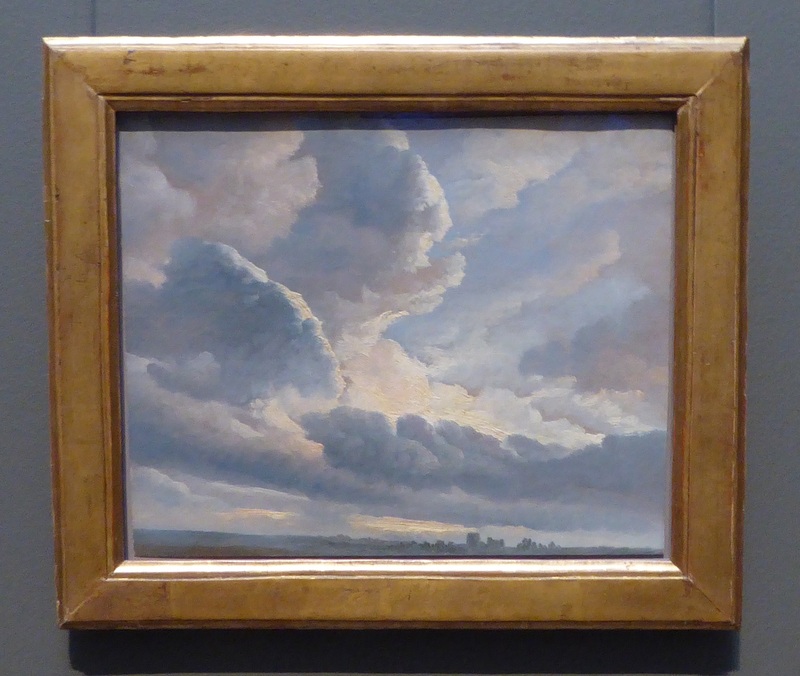 This is “Study of Clouds with a Sunset near Rome” by Simon Denis. When I saw it, I was reminded of a photo I took in Viet Nam (which you can find here) due not so much to style or color, but to the expansiveness of the sky. It’s the first photo in that post, called Keo Pagoda. (Upon looking back at that post, written in 2012, I’m hoping my writing and blogging style has improved somewhat since then – yeesh!). 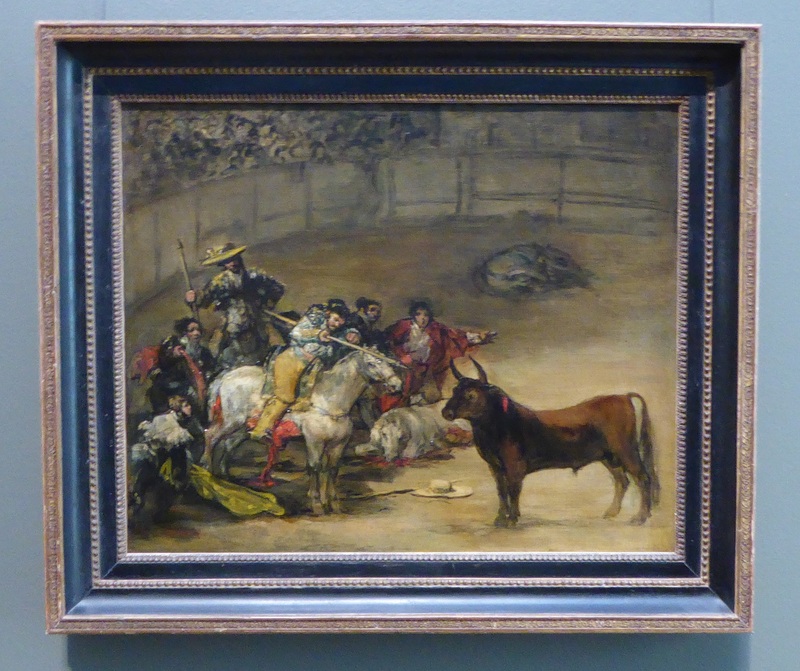 Goya – “Bullfight, Suerte de Varas.” I understand that he was passionate about bullfighting. Me, not so much, no. I do love this next painting of his, though. 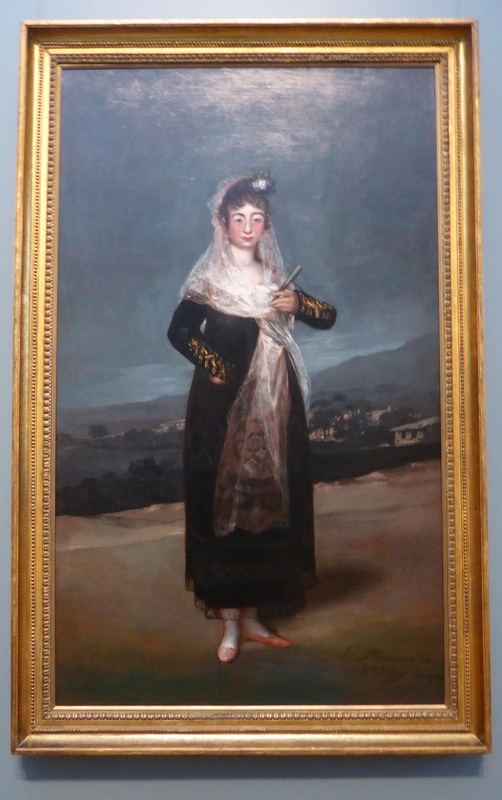 It is “Portrait of the Marquesa de Santiago.” He had a realistic approach to portraiture and didn’t idealize his subjects. I recommend the movie ‘Goya’s Ghosts.’ It’s about Goya, obviously, but really more about Goya’s time and the horrors and casualties of the Catholic Inquisition. Well acted, good movie. This painting reminds me of a scene in it. Such a privilege to see this, to actually be close enough to see his brush strokes. 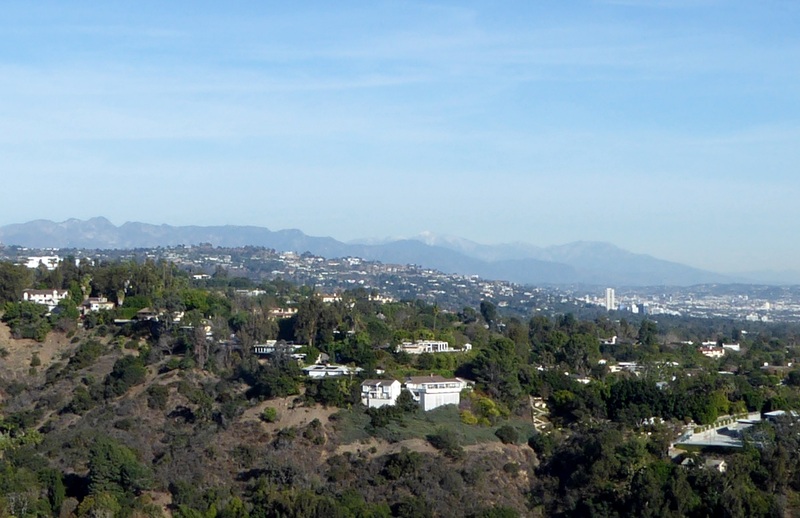 Panorama of the city with a garden area jutting out from the Getty. 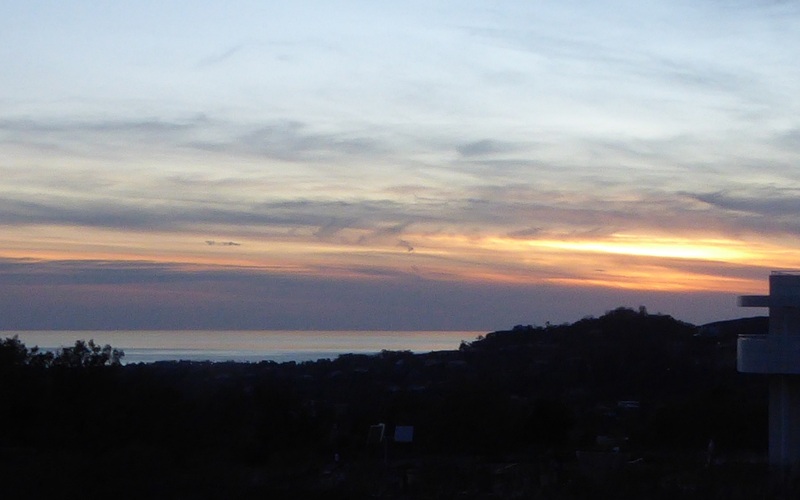 Looking out once again toward the Pacific as the sun begins its decent. The travertine stone for the Getty was sourced at “….Bagni di Tivoli, 20 kilometers east of Rome, where travertine deposits over 90 meters thick have been quarried for over two thousand years.” Other famous sites constructed with Tivoli travertine are “….the Colosseum, the Trevi Fountain, the colonnade of Saint Peter’s Basilica, and many Roman aqueducts. 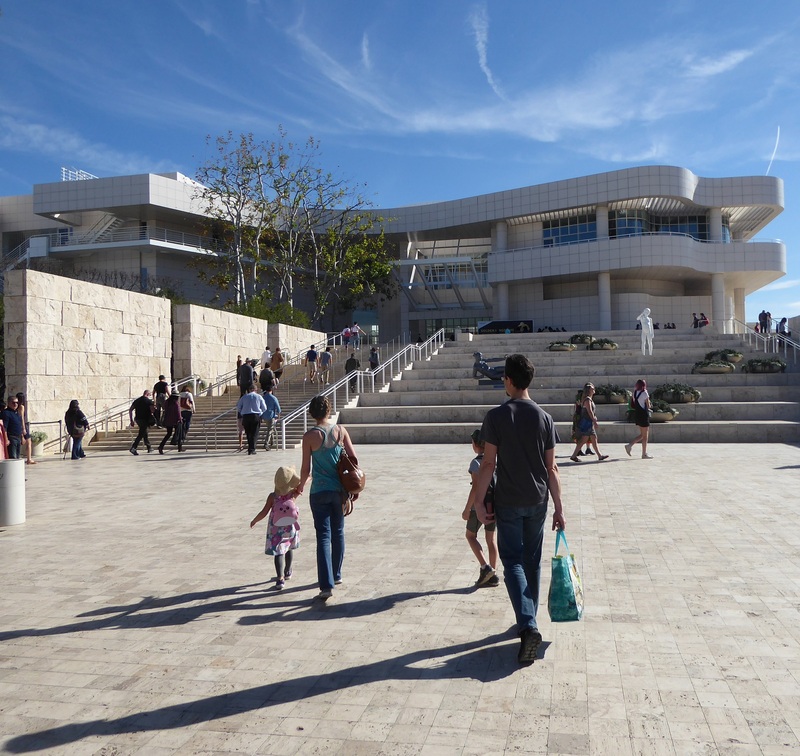 In our century, Lincoln Center in New York and the ABC Entertainment Center in Los Angeles are faced with travertine from the same Tivoli quarries.” Over 108,000 square meters were quarried for the Getty. 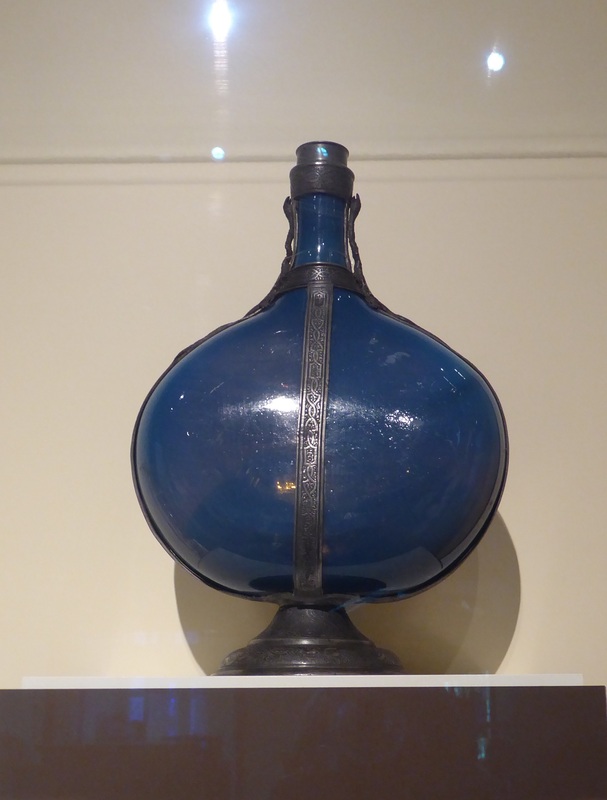 This information was gleaned from the Getty Museum website. 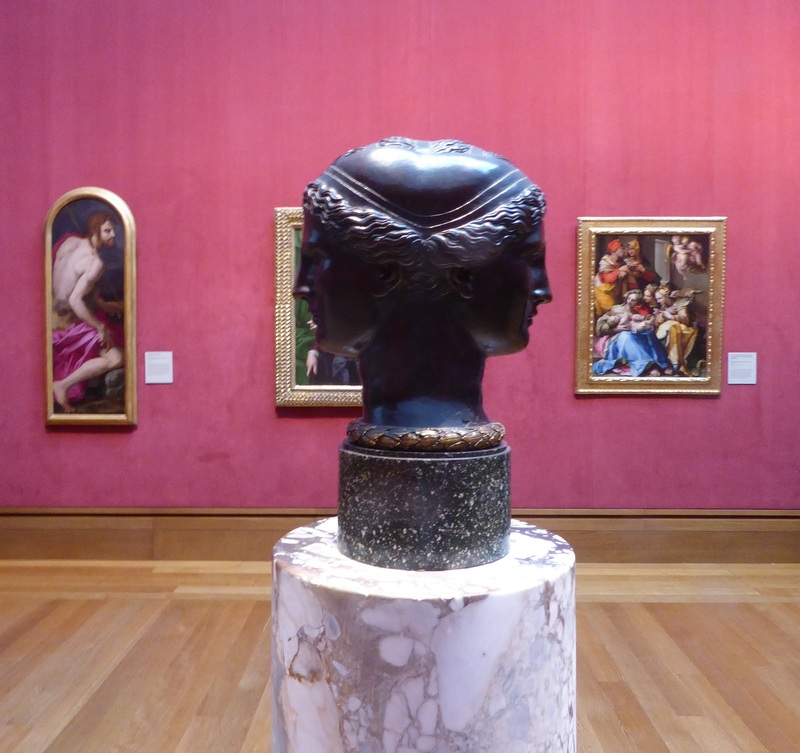 I went to The Getty a few years back, and it was fantastic 🙂 Thanks for posting! This brought back a lot of great memories. Isn’t it funny when you were in Columbia you always had stuff to write? I post a bit, but in Panama I had stuff to post all the time. I bet where we live is just as interesting but we’re just to used to it. Beautiful pics. I am in awe of anyone that can do carving or sculpture. I’ve tried it. My wife laughed so hard at my work. That made it all worth it. 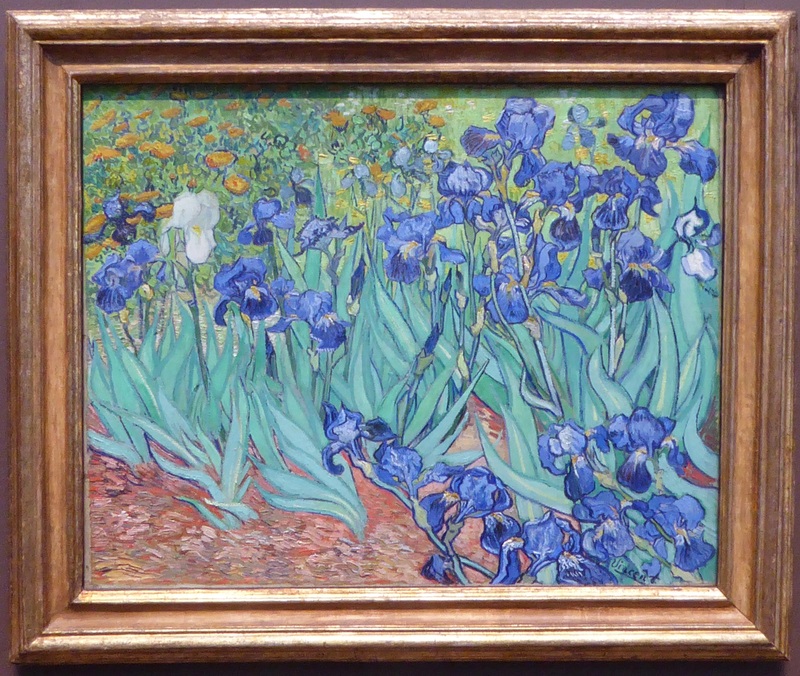 I always loved Van Gogh but it wasnt until I saw them in the flesh (at the Musee D’Orsay) that I realised how even the best reproduction in print could not come close to the power of them in life. If you get to Paris you must go (I’ll come too). That would be fantastic, Sair. I do hope to make it to Paris some day. It would be great to see it with you. I like Jim’s comment. I’m commenting on a comment about your post. I invite someone to comment on my comment comment. Perhaps we can go through the looking glass – transcending mere post comments to blogvana. Join me. The States are lucky to have ya back. Everything went to hell when you left. 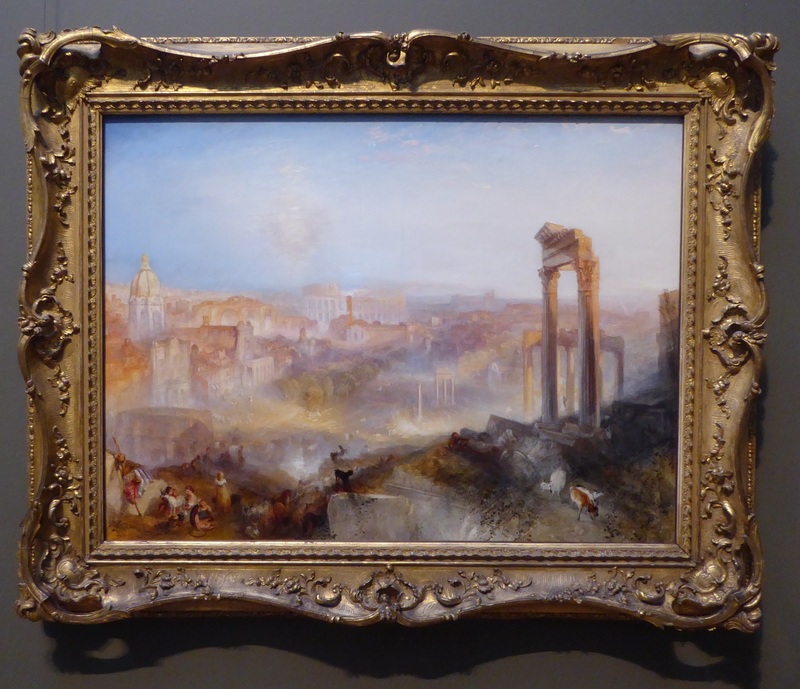 The Getty is an excellent museum in a stunning location. Looks as if you had an wonderful day there!